I realize this is very early in the morning for a sermon, so I want to begin with a story to help you wake up. A Lutheran Pastor, a Pentecostal preacher, and a rabbi got together one day for coffee and to talk shop. One made the comment that preaching to people isn’t all that hard. A real challenge would be to preach to a bear. One thing led to another, and so they decided to each go out into the woods, find a bear, preach to it, and attempt to convert it. Seven days later, they all came back to discuss their experiences. Pastor Hammer, had his arm in a sling, was on crutches, and had various bandages on his body. “Well,” he said, “I went into the woods and when I found a bear, I began to read to him from Luther’s Catechism. That bear wanted nothing to do with Luther’s Catechism and began to slap me around. So, I quickly grabbed some water and poured it on his head and said, “I baptize you in the name of the Father and of the Son and of the Holy Spirit, and, Amazing Grace, how sweet the sound, he became as gentle as a lamb. He’s been coming to confirmation classes and next week he will be confirmed. Rev. Billy Bob spoke next. He was in a wheelchair, had one arm and both legs in casts. Sometimes the best parts of a story are in the details. The gospel of John tells us a story of the first Easter that is unlike any of the other Gospel accounts. And as is so typical of John’s accounts, this one is full of detail. But also – as is always true of John, none of the details is without meaning. 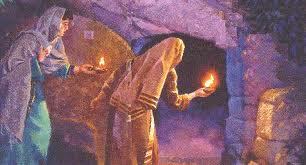 For instance, John tells us that Mary Magdalene came to the tomb “While it was still dark.” The darkness is symbolic of the sadness, grief and sorrow that Mary felt at Jesus’ death. And then, when she discovers the empty tomb, she runs back to the other disciples to tell them. And then Peter and the other disciple, who is probably John, run to the empty tomb. Their running indicates anxious fear and the shock at the surprising news that Jesus’ body is gone. Anyway, the other disciple, probably John, gets to the tomb first, but he doesn’t go in. He looks in, but doesn’t go in. Peter, who comes next, just barges right into the tomb. Peter looks around, sees the linen wrappings, but no Jesus, and he probably figures, like Mary, that someone stole his body. Then John goes in, looks around, and sees the same things that Peter sees, but John believes. John has a different interpretation of the evidence. For John, the linen wrappings lying there don’t signify that someone stole Jesus’ body. No, they signify that Jesus has risen from the dead as he said he would. So, according to this Gospel, the first person to believe was St. John – the disciple after whom our church is named. But Mary stays. Mary remains at the tomb, crying because she cannot find Jesus’ body. Then she sees the resurrected Christ, even though she doesn’t know that it is Him. It was not until Jesus called her by name that she recognized him. And then Jesus tells here, “Do not hold on to me…I have not yet ascended to my Father…But go and tell my brothers.” Finally, Mary understands! Jesus has risen from the dead! Her relationship with Jesus will change. Jesus will not be more than her teacher, he will be her Lord, and not just hers, but over all creation, for all time. There is an inherent mystery to the Christian faith. At the core of the Christian faith is some sort of belief in Christ’s resurrection and yet, no one really knows what happened when Jesus rose – no one was there to witness it. We haven’t seen him, and if we have, we didn’t recognize him. I think there are times in all of our lives when we have moments of doubt, moments of confusion, moments where we do not understand and we’re not sure what it is that we really believe. And yet, there are those times when Jesus calls to us. I don’t mean, out loud, like a voice we would hear with our ears. Instead, what I mean is that Jesus calls to our hearts and our mind. We have this sense, deep down, that Jesus knows us, knows our name, and is calling us to believe that he is real, to follow him, and to be involved in his mission in the world. And these are the moments when we begin to believe in the resurrection, that Jesus is alive. Mary didn’t believe until Jesus called her, until Jesus said, “Mary!” and then said to her, “Go to my brothers.” Mary didn’t understand the resurrection of Jesus and what it meant for her until he called her. Maybe we are not supposed to understand until Jesus calls us, either. And so, here’s the question to take home this Easter: what it Jesus calling you to do? What is Jesus calling you to do in this church? How is he calling you to get involved? Is he calling you to make quilts? Is he calling you to make visits to the sick and shut-ins? Is he calling you to teach? Is he calling you to sing or share another one of your other gifts? Is he calling you to lead, maybe as a member of the church council, or serving on one of our commissions? Is he calling you to try something you have never done before? And what is Jesus calling you to do outside of this church? Is he calling you to spread the Gospel, to tell others how you have experienced Christ as good news in your life? Is he calling you to reach out to those in need, to cry out for justice, and to resist evil? Is he calling you to breathe life and love into someone who is despairing? Is he calling you to offer encouragement to those around you? Is he calling you to extend forgiveness to someone? Again – is he calling you to try something you have never done before? What is Jesus calling you to do? How is Jesus calling you into his resurrection mission in the world? I think when we start to listen for Jesus calling us then we truly begin to understand the mystery of the Christian faith. Then we begin to understand what his resurrection means for us. Remember the truth of Easter everyday. Jesus is alive, Jesus is eternal, Jesus is Lord…and he calls us to become involved in his resurrection mission in the world. So go forth from our worship today, knowing that Jesus is alive! Listen for his calling in your life, for then we will begin to understand what his resurrection means for us.